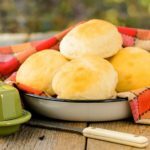 A recipe for Buttermilk Rolls that are homemade yeast rolls. They have a lovely buttermilk tang and are easy to make - just mix, knead, shape, chill, and bake. Line a baking sheet with parchment paper or sprinkle with cornmeal. Combine all the ingredients in a stand mixer and knead with the dough hook until smooth. You can also mix the ingredients in a large bowl, then knead by hand. Cover the bowl and set aside to rise until the dough has doubled in size, about 1 hour. Flour your work surface and turn out the dough. Divide it into 12 equal pieces and roll each piece into a ball. Arrange the balls on the prepared baking pan and cover it with plastic wrap or place it in a large plastic bag and tie the open in closed. Refrigerate overnight or up to 24 hours. Take the dough out of the refrigerator and heat the oven to 350°F. Remove the plastic and bake the buns until nicely browned and the internal temperature reaches 195°F on an instant-read thermometer, about 25 minutes. Transfer the buns to a wire rack and let cool. Recipe © copyright Donnie Currie 2014. Used with permission. Time stated does not include time for refrigerating dough overnight.